An astonishing find could change how scientists understand Neanderthals. 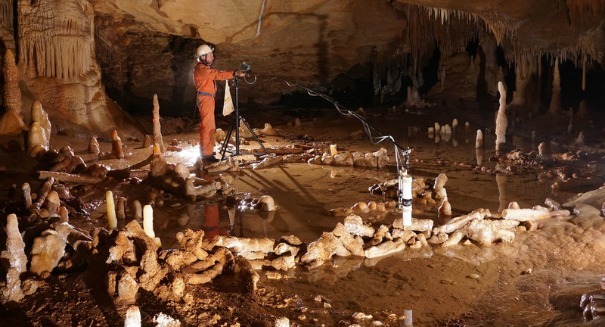 Scientists have made an amazing discovery in a cave once used by Neanderthals in southwestern France. The cave was discovered in 1990 by a French archaeologist within Bruniquel Cave, and an obstructed entrance was found that held an incredible mystery: broken stalagmites on the floor and arranged into large ovals. Now, scientists think they have an expxlanation: this cave was used by Neanderthals 176,000 years ago, an amazing discovery as Neanderthals weren’t known for being builders or cave explorers, but here they appeared to be doing both, according to a letter published in Nature. In 2013, scientists tried to go back to the site, intrigued by the unnatural structures of stone spikes that formed fences almost 2 feet high. They made an additional discovery: piles of calcite stone fragments that later proved to be 176,000 years old, long before modern humans ended up in Europe. Even more incredibly, the location is 1,000 feet from the cave entrance, indicating that Neanderthals ventured deep underground and away from sunlight. As far as why the structures were built, that’s still a mystery. They could have served a ritual purpose, or perhaps they were used to create fires for cooking and keeping away bears.